Conclusion of the Love's Refuge Blog Tour! Another blog tour has come to an end...but that doesn't mean the excitement is over! Be sure to head on over to The Curried Nut for one last tour stop that includes Meagan's thoughts on Love's Refuge and an interview with Sandra. *Update: Meagan's also hosting a 2-book giveaway, and there's a review of another of Sandra's books on Bluerose's Heart! * Then consider following me or Sandra on Twitter (@SeasonsHumility & @SLeesmithAuthor), Facebook (Sandra Wardman Smith), Google+ (+AmberStokes), Pinterest (Amber Stokes), Goodreads (Amber Stokes & Sandra Leesmith), this blog, and/or Sandra's website. to stay in the know on any upcoming Sandra Leesmith announcements and releases. What's coming next? Love's Refuge in paperback and audiobook formats! Stay tuned for more details. And now, for the winner of the basic Kindle loaded with Sandra's books! Congratulations, Ann! You have until next weekend to reply to the e-mail I sent you before another winner is chosen. Happy reading! While there's only one winner of the Kindle, everyone's a winner with the Love's Refuge e-book special! Be sure to pick up your $.99 Kindle copy today, as the price goes back up to $2.99 tomorrow (which is still a good deal if you read this later - so no need to stress too much!). And if you're wondering about those extra book giveaways hosted on participating blogs during the tour, those are being run separately by the owners of those blogs. The Wonderings of One Person winner has already been chosen (congratulations, KC! ), but the following blogs' giveaways are still open: Tell the World (only 1 more day! ), i blog 4 books (1 week! ), and Best Reads (only 1 more day!). Sandra and I are grateful for the following bloggers and their participation in this tour - it couldn't have happened without them! We appreciate their time and effort in making the tour a success. I'd also like to thank all the readers who followed the tour and helped spread the word, as well as Sandra, who has been an awesome client to work with since she was the very first earlier in 2013! Have a lovely weekend! Enjoy a good book and some leftovers! 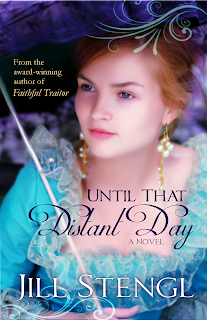 Until That Distant Day... A Colorful Cover Reveal! Today is a very special day... Jill Stengl has a brand-new cover to reveal - on her birthday, no less! 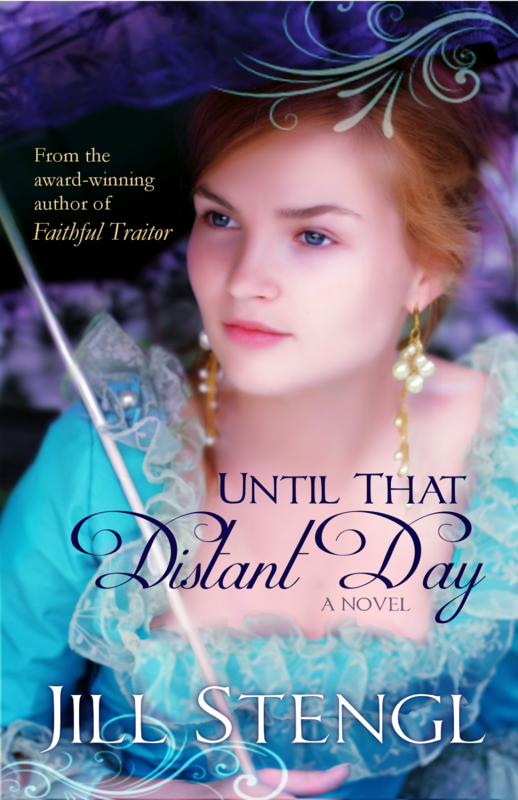 Until That Distant Day is an historical romance set during the French Revolution, and it's one of the first books to be released from Rooglewood Press (owned and run by author Anne Elisabeth Stengl). The novel will be available April 25, 2014, but in the meantime, check out it's stunning cover! My Thoughts: The epitome of historical romance covers! Nothing makes a female reader beg to take a trip back in time like a lovely, vintage outfit, right? The dress, the jewelry, the parasol - all show elegance and sophistication and hint that the story and writing will be laced with those things.Then there's the details like the title font that has a bit of fanciness, but suggests even more boldness, fitting with the book's description. There's the swirls at the top and the faded background that add a sense of mystery. And finally, I just have to say that the blend of colors is gorgeous! The purple makes the model stand out, perhaps with a royal flair. Blue suggests a quiet strength, but its vibrant shade hopefully hints at a bright personality beneath. Her hair is fiery, but not in an uncontrolled way. And her complexion is fragile, but her gaze is fearless. I love all of the dichotomies! I imagine a heroine such as this one, living in such difficult times, must have both sides to her. What are your thoughts on the cover design? You can connect with Jill on her blog, Books, Cats, and Whimsy, or on Facebook. So, let's wish Jill a very happy birthday, and do share your thoughts on her new cover! Who: Open to everyone with a social media account! Since I'll be hosting a blog tour in December (sign-ups are still open), and there might be other things to post, I probably won't do all of the daily challenges. But I probably won't be able to resist some of them - like spine poetry, which is just too fun! You can follow the read-a-thon tweets via the #ReadingCram hashtag. And if you'd like to join us, you can sign up for the read-a-thon HERE! I just got back not that long ago from seeing Catching Fire at the theater... Oh. My. Goodness. So intense!! While Catching Fire was not my favorite of the books when I read through the series, I think this movie is even better than the first. I'm not sure yet if I'll write a full review - we'll see! If I was going to accomplish anything more for the Contentment Reading Challenge, re-reading The Hunger Games series would probably be a good idea! As it is, I've re-read five books this year - two more than the first year I hosted and participated in this challenge - putting me firmly at the "Wading" level. It's not as much as I had hoped to accomplish, but it was an enjoyable experience nonetheless, and it was good revisiting dear "friends" because of it. I know I have another month to do some more re-reading, but I think I'm going to be doing a different, informal challenge instead: catching up on my review books. Some of the books in my review TBR pile have been there for way too long, and my goal is to try to catch up on my review reading by the end of the year, so that I can start 2014 fresh with a new release or two to review in January. 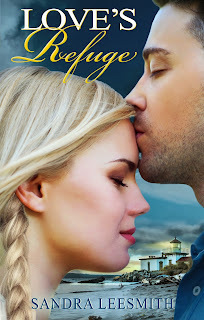 For the blog, besides lots of reviews, Lord willing, you can also expect a cover reveal on Wednesday (for author Jill Stengl, in conjunction with Anne Elisabeth Stengl), the conclusion to the Love's Refuge blog tour next Saturday (have you entered for a chance to win a Kindle yet?? ), and a Christmas cat-detective story blog tour in December (sign-ups are now open for interested bloggers!). For my time away from the blog, I've got an editing project to finish next week (S/O to wonderful client, Miranda Uyeh! ), and I've got to really dig into rewrites for Forget Me Not. I'm thinking the blog tour won't be until the end of January at the earliest, so it will be a little while before bloggers hear from me. Rewriting and editing (with the help of Rachelle Rea) will take some time, but it's important, and I think the process will be good for me - and hopefully for my readers, since the story should be better because of it! 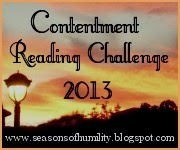 Back to the main topic of this post...what's to come for the Contentment Reading Challenge? Well, I'll probably write one more post in December to conclude everything and give any participants a chance to share how they did overall and what their favorite re-reads were (etc.). But as for 2014, I think I'm retiring the challenge. Perhaps we can just do some unofficial re-reading and sharing about our old favorites off and on, or something...? I know there are some great books I've read that would be nice to re-read someday! And I still have a lot to learn about contentment and continually cultivating it in my life. If you're participating in this challenge, have you made any progress lately? If not, are you doing any other reading challenges or hoping to play catch-up like me? And chocolate can always be enjoyed, whether you're watching an episode online or on TV, right? Now, we haven't watched the episode all the way through yet, so here's hoping there's not something embarrassing that we didn't realize they had filmed, LOL. And to be honest, I have no idea if any of you will be able to pick us out of the crowd, as we never got called down. But if you want to play "Where's Waldo?" - Amber & Brenda style! - feel free to check out the link above. The picture at the top of this post shows the shirts we were wearing, and we were a few rows back on the right side (when you're facing the audience). There was someone who got called down right in front of us, so I know for sure you can catch a glimpse of us then. And the winners sat a couple of rows in front of us, so maybe we have a little more screen time. It's a pretty exciting episode (with an especially awesome win! ), so I hope you enjoy it regardless! ...I'm under the spell of George and Drew! Have you ever had the chance to "come on down" for this game show or another? Or which show would you like to participate in if you could? Hope you all have a great, chocolate-filled weekend! Launch of the Love's Refuge Blog Tour! If winter blues are starting to set in and you're looking for a refreshing escape from the upcoming holiday rush, Sandra Leesmith's latest release offers a unique island vacation for fans of inspirational contemporary romance (with a dash of suspense)! Love's Refuge is set on a fictional island (based on a real one) in the Puget Sound region of Washington state, and it features another hero and heroine struggling to come to terms with their pasts in order to embrace a fearless future. The Kindle version is available now, and a paperback version is coming soon! My last project with Sandra involved reworking and republishing a book that had first been published in the '80s (Love's Miracles). But Love's Refuge is a brand-new story that I had the pleasure of editing. (Blogging friend Rachelle Rea also proofread it.) And now I have the pleasure of sharing it with you - with the help of some awesome bloggers - via this blog tour! 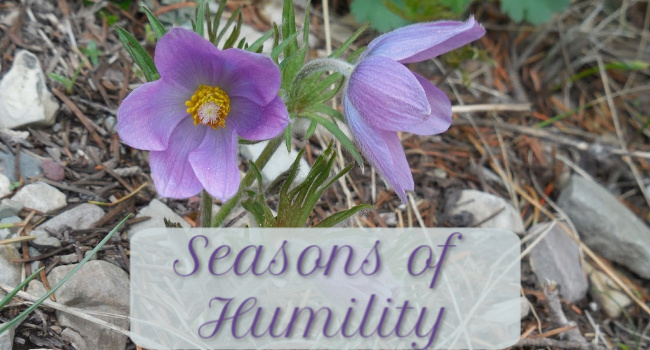 Introduction to the tour at Seasons of Humility ← You are here! To grab the blog button and find info about the author, a link to purchase the book, and more book news, be sure to check out the blog tour page! You can learn more about the prize HERE. (And you can learn more about Sandra's romance novels HERE.) This is actually the Kindle device I have, and it's so handy! In addition to this tour-wide giveaway, several participating blogs will be hosting separate book giveaways - so be sure to check out each stop along the way, enjoy the reviews and interviews, and don't miss out on any of the fun! "In True Love Dates, Debra Fileta encourages singles not to 'kiss dating goodbye' but instead to experience a season of dating as a way to find real love. Through reading powerful, real-life stories (including the author’s personal journey) and gaining insights from Fileta’s experience as a professional counselor, readers will discover that it is possible to find true love through dating." You can learn more about the book and author on the True Love Dates website. When I came across a positive review for this book on a blog I follow (Emily Rachelle Writes), I was intrigued. 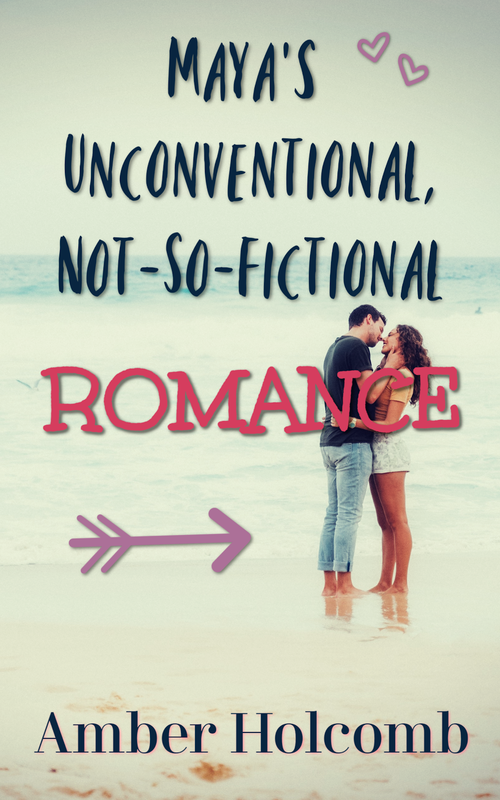 Modern romance seems fraught with complexities and uncertainties that have to be navigated, so any solid advice is welcome - and it's always encouraging to read about the various ways couples find each other and discover love. True Love Dates is divided into four parts: Dating Inward, Dating Outward, Dating Upward, and a section dedicated to FAQs and the author's responses. I really appreciate Fileta's perspective, looking at dating in its place within one's whole life rather than focusing only on the act of dating itself. From sharing her thoughts on common concerns that young people have about dating, to helping the reader keep the big, hopeful picture in mind, Fileta has written a book with heart that has a lot to offer those who have questions about love. If you read my author's note at the end of Bleeding Heart (or if you've been following my blog for a while), you've heard of Falk's Claim: The Life and Death of a Redwood Lumber Town by Jon Humboldt Gates. It's a book I picked up on a whim at the visitor center at Prairie Creek Redwoods State Park, back when I was editing Bleeding Heart earlier this year - and I'm so grateful I did! The book corrected some of my misconceptions and gave me a better understanding of Falk, helping me fall more and more in love with its fascinating history. I was going to attend a lecture by Mr. Gates back in October, but the government shutdown postponed the event. Thankfully, the lecture was rescheduled, and I had the chance to attend yesterday with my mom. And just like I was grateful to have happened upon his book, I'm so grateful my mom and I took the time to go and meet him. Mr. Gates' love for the people who were part of the town's history was evident, and I enjoyed hearing what he had to say about his book and all the work that went into it. (Apparently the book went through five different drafts, all of which his mother typed out on a typewriter! Mothers are wonderful, aren't they?) He firmly believes in the importance of primary interviews, hearing the stories from the people who lived them. He noted that the project was "more than a book" to him - it was about getting to know the people who made the town. Apparently "one of the most electric moments" for him while he was working on this book (in the 1980s, I believe) was organizing a luncheon at the Eureka Inn for the people he had interviewed who used to live in the town. A lot of them hadn't seen one another in so long that they were so excited to catch up! In a similar manner to how Mr. Gates felt about his project, I felt like attending the lecture was about more than the interesting facts I heard. I appreciated seeing and meeting other people who were interested in learning about and preserving the town's history. A few asked questions and chatted back and forth about memories and knowledge during the lecture, which was in one of the old town buildings that had been moved and converted into an education center. And after the lecture, we went outside and walked down the trail (Headwaters Forest Reserve) a ways, enjoying the bright fall sunshine and getting a glimpse at what the town used to be through people who knew about it. I don't know if this is too soon to write this, or if it will always be too soon. This is my first deep, close-to-home experience with grief, and the pain is still so raw, the shock still so strong, that I can't comprehend how it will manifest itself in the days and months to come. It is not my intention to trivialize my family's sorrow by writing this here and now, and I hope it won't be seen that way. But you are my friends, and I can't expect understanding and patience from you in this time if you don't know that I'm in need of them. So here I am, with my heart laid bare. My grandma passed away a couple of days ago, late Halloween morning. My grandpa is the one who has been in the hospital and rehab in the past weeks, and so her death came as a complete shock to us all. Perhaps it shouldn't have, with all of the stress she'd been under, but it did. My grandma was the sweetest, most caring and wonderful person you could know. She was one of my dearest, dearest friends, and she loved her family with her whole heart. She gave the most beautiful tole painting projects she'd made, absolutely delicious meals, the warmest hugs, and her time - telling stories, writing letters and calling me while I was away at school, and always, always being there to listen, to pray, and to love with all that she had in her. I'm grateful to God that I had the chance to know her and my grandpa these past twenty-two years, to grow up not far from their home and to get to spend so much time with them. I only wish now that I had more. Her passing was peaceful, and I know she's at home with the Lord. But as my mom said, she made everything special, and my grandpa and parents and sister and aunts and uncles and cousins and I...we'll all miss her desperately until we get to see her again. My grandma set such a beautiful example of love and humility, and she leaves behind a precious, faith-filled legacy - one that, through God's grace, I pray I will never forget. If you would be willing to pray for my family - for comfort and peace and wisdom with being there for my grandpa and one another, making arrangements, and facing the loss over and over again - it would be greatly appreciated. Thank you all for your friendship and love.